I’m awake in the thin hours again. I dreamt that I was flying through a furious storm with a choir of wounded Angels. 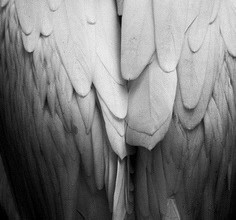 So I lie here, thoughts drifting through my mind like falling feathers, some dark and threatening, others mere wisps, barely formed. The dark ones cast a pall over me- leaving tight, anxious feelings in their wake. I’m sure some of it is not my own. I watch the parade on the stage of mind, pick out familiar faces, clients, friends, many of their brows heavy with anguish, carrying loss like thorny bundles in their arms. Sometimes this work I do, this work I love, is hard. I sit with grieving mothers, lost children, adult orphans- good people in often unbearable torment. It does not escape me that the development of self awareness cultivates suffering. So why would anyone come into therapy? Perhaps people come in when the pain of staying the same is greater than the pain of change. The problem though, is fear, because with change comes fear, no matter how much we have convinced ourselves otherwise. I listen to the primal rhythms of fear and loss every day and still… after more than twenty thousand hours of being a midwife for change, I am in awe of the human spirits’ capacity for regeneration. I have watched lives rise from the ashes and I have borne witness as lives have turned to dust. There is no audience for the shifts that occur deep within us, the hopes, the crippling struggles. If we are blessed enough to have loved ones in our lives, they are often absorbed in their own journey. At times we all feel invisible, as if no one would notice if we just evaporated. Perhaps we are all evaporating slowly, desperately clutching for meaning before we go. So why not share your story with an other? To know that you are not alone and that we are all in this together can lighten the burden. Therapy is but one finger on the hand of change, but a deep encounter with another human being, to be seen, to be recognized and hopefully – to be known- is a powerful medicine for the soul.